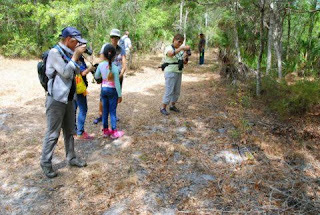 Florida has two native species of anise that look quite different and are found in very different regions of the state. Both bloom in spring. 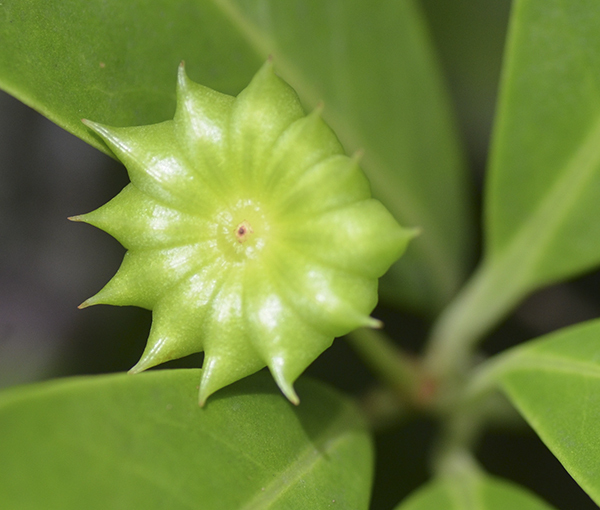 Star Anise The Yellow Anise Tree/Star Anise, Illicium parviflorum, is found in hydric hammocks in a handful of Central Florida counties from Marion to Polk. It reportedly once occurred in Georgia, but has been extirpated. While classified as endangered in Florida, it is locally common in places such as the Marion Creek Basin in northeast Polk County.The type specimen was collected in 1799 in Marion County. This perennial wildflower reaches 3' tall with smooth stems and lanceolate to elliptic leaves from 3–4" long and ¾"­–1" wide (the uppermost leaves are sessile). It can form large, multi-stemmed clumps and is easy to see when in flower. 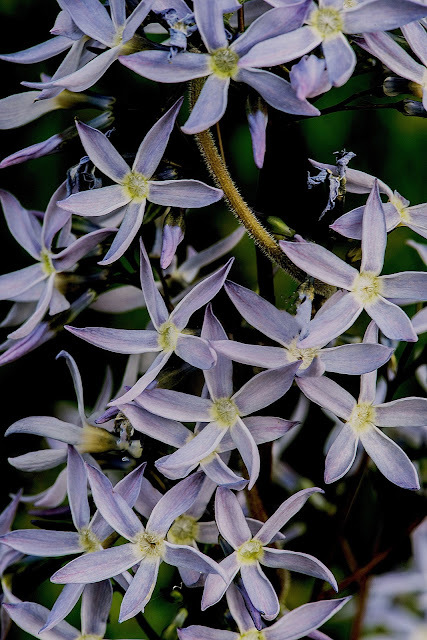 Pale blue, ¾", star-shaped flowers are in terminal clusters. Flowering season begins in March and lasts into August so look for it in the floodplain forests of the Florida panhandle east to Columbia, Alachua, and Levy Counties. It ranges across the eastern United States to Texas, Oklahoma, and Kansas, and is on its southern range extension in Florida. On our way to Camp Lonesome there were two crested caracaras beside the road, and we saw turkeys with cute babies. Beautiful bright yellow meadowlarks were singing melodiously, as if to welcome us as we drove up to the gate. A loggerhead shrike was catching breakfast in the field as we gathered to begin our hike, and blue gray gnatcatchers, northern parulas, and cardinals were calling from the trees as we started to walk. Whitemouth Dayflower, Commelina erecta, is a prostrate, herbaceous, perennial wildflower with very showy morning blooms which may bloom throughout the year. 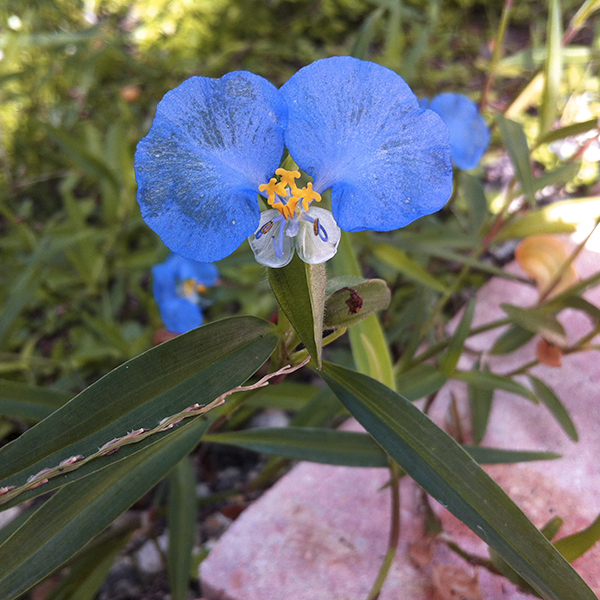 The flower is quarter sized, bright blue, with two larger ear-shaped petals and a small white lower petal (the mouth). 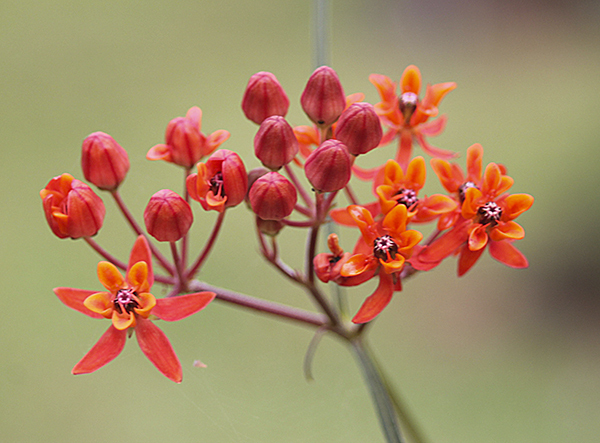 A. lanceolata is tall with a herbaceous stem that does not branch. Leaves are very narrow and lanceolate. Flowers are orange to red and yellow. Flowering occurs in early summer. It is a larval host plant for monarch and queen butterflies and a possible larval host for soldier butterflies as well as providing nectar for monarch and other butterflies and insects.